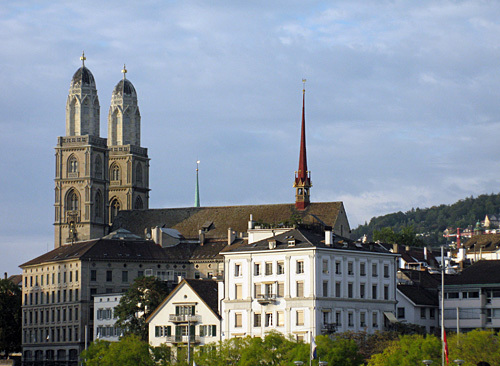 With a population of almost 400,000, Zurich is Switzerland's largest city. Many people associate Zurich with banking. The city is the world's most important market for trading gold and the 4th largest stock market after New York, London and Tokyo. Only few people know that Zurich features top sights: cobbled lanes, medieval houses and a dazzling lake. The Limmat River bisects the city. Tree-lined Bahnhofstrasse dominates the west bank. Narrow pedestrian alleys brimming with boutiques, restaurants and stylish beer gardens are on the east bank. Hop on a boat and cruise on Lake Zurich. Amble along Bahnhofstrasse and do some (window) shopping. Spend the evening in one of the clubs or pubs. Or are you more of a music lover? Head for the Opera House for classical music, operas and ballet performance. Are you more the modern music type? Schieffbau Schauspielhause stages performances of young, hip artists. If this is not your favourite music, head for Schiffbau anyway. Once a wharf building lake steamers and until the early 1990s a factory for turbine parts, Schiffbau is an interesting example of industrial architecture. Twin-towered Grossmünster or Great Minster dominates Zurich's skyline. The interior is stripped from all its splendor exactly as Zwingli and the Reformers liked it. Huldrych Zwingli was the initator of the reformation in Switzerland and paved the way for Calvin who is seen as the great reformer. Fraumünster or Women Minster is easy to recognize by its slender spires. Russian-French artist Marc Chagall designed a series of five stained-glass windows for this church. The Swiss painter Augusto Giacometti created the rose window depicting Marc, Matthew, John, Luke and eight prophets framed by ten angels. Sandwiched between Bahnhofstrasse and the Limmat River, Lindenhof is the oldest part of Zurich. Once the site of a Roman custom post but today it is a leafy square. Pensioners come to play chess. Youngster talk on their mobiles and mothers play with their children. This is the perfect place to enjoy sweeping views of the river, the Old Town, Grossmünster and the City Hall. This wide avenue is Zurich's answer to the Champs Elysees and guarantees sophisticated shopping. 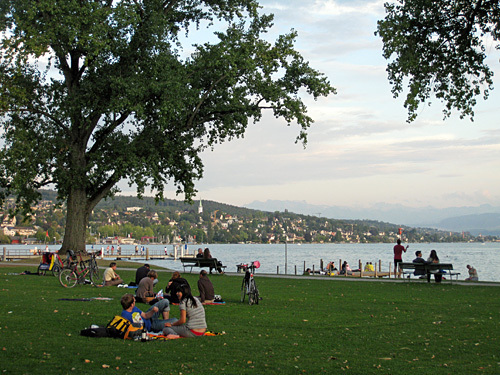 Planted with 200 lime trees and 1.4 km long, Bahnhofstrasse runs from Central Train Station to Lake Zurich. One hundred and eighty shops sell the best Switzerland can offer, from fashion labels, furs, porcelain and watches to Swiss chocolate. Sun-seekers, in-line skaters, footballers, picnickers, young lovers and families crowd the green parks along the lake. The waterfront is a popular meeting place and the perfect place for dining al fresco. Locals and tourists alike bring wicker picnic baskets. While munching salmon sandwiches and sipping champagne, they watch the sun sink into the silvery water of dazzling Lake Zurich.